Currently Rough Rider offers four rigging knives (marlin spike knives). All four knives are based on the old Camillus 697 pattern rigging knife. This pattern dates back to the official pattern adopted by the U.S. Military as early as 1942. Like the original knives, the Rough Riders feature a large non-locking sheepfoot blade and marlin spike that is locked in place by the bail. The knives all feature ringed nickel-silver bolsters and either bone or composition handles. The scales are attached with brass pins and all the knives also feature brass liners. All Rough Rider riggers feature the late model double back springs of stainless steel. This makes the blades easier to open while keeping them in place when they are opened or closed. 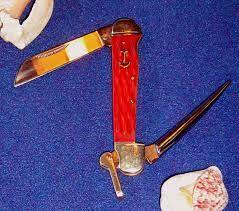 Most Rough Rider patterns are offered in either the amber or red jigged bone; or both. Such is the case with the Riggers. I'll tell you up front, I'm not a fan of the early red jigged bone. ( I do like the later red bone.) The fit and finish is excellent but the early red jigged bone is not at all my favorite. The early red jigged bone reminds me of tomato soup. . I know there are people out there that like the earlier red bone but to me it lloks like cheap plastic. Fortunately, it seems like Rough Rider has changed its Red Dye process and latter bone is darker and richer. I would suggest buying the Red Bone through smoking Mountain Knife Works to reduce the odds of getting older tomato soup bone.